Average Height	: 20" - 23"
Adopt A Husky of Dallas, Inc.
Siberian Huskies were used for centuries by the Chukchi Tribe, off the eastern Siberian peninsula to pull sleds, herd reindeer and as a watchdog. They were perfect working dogs for the harsh Siberian conditions: hardy, able to integrate into small packs, and quite happy to work for hours on end. The dogs have great stamina and are lightweight. Native to Siberia, the Husky was brought to Alaska by fur traders in Malamute for Arctic races because of their great speed. In 1908 Siberian Huskies were used for the first All-Alaskan Sweepstakes, an event where mushers take their dogs on a 408-mile long dogsled race. The dogs gained popularity in 1925 when there was a diphtheria epidemic in Nome, Alaska. Siberian Huskies were used to bring in the much needed medicine to the people. In the early to mid-1900s Admiral Byrd used the dogs in his Antarctic Expeditions. Good-natured, playful, agile and free-spirited are some of the adjectives used to describe this endearing breed. But as much as these traits may seem easy to deal with, the truth is that this breed has many needs. Siberian Husky come with both Blue and Brown Eyes. For starters, this is a breed that loves the outdoors and loves to run. Make sure that you can meet its needs for vigorous exercise and mental stimulation. Siberian Husky training is not the easiest task due to this breed's stubborn and independent streak. Patience, consistency and loads of supervision will help training Siberian Husky puppies. Food rewards may also help give him some motivation. Siberian Huskies love to roam and are excellent escape artists. While they rarely bark, they can produce some "interesting" sounds! They can also howl, especially when other huskies are around. If you are planning to acquire a Husky to protect your home, you may want to think again and stick with another breed. This breed is too good-natured and accepts just about anyone. This breed gets along well with children, but since Huskies have a tendency to play rough, small children are at risk. Huskies are sociable and easy going with other dogs; however, small pets, including cats, are at risk of turning into a lip-smacking dinner. Nothing makes this breed happier than running and playing in the great outdoors, especially in cold weather. Providing it with plenty of exercise is a must and not an option. So it's not surprising that the best owner for Siberian Husky puppies and dogs is an outdoorsy fellow who loves to walk, bike and hike. If you are planning to keep your Husky out in the yard all day, keep in mind that this is a breed that loves to dig. It's not unusual for Husky owners to find their yard magically transformed into something resembling planet Mars! Huskies like to howl, especially when other dogs are around. Since not many people will be eager to hear your Husky's mournful songs when you leave him home alone, this breed will do best in a suburban environment with lots of space to romp around. Huskies are known for having a "Houdini" reputation, so a fence is a must with this breed. But what they cannot climb they will try to dig under. Make sure your fence is high, has wire sunk into the ground and that your gates have the best locks in town. As mentioned, this breed requires lots of exercise and mental stimulation. With the desire to work deeply ingrained, it was never intended to be used as a pet. Fail to keep this breed entertained enough and you may end up with a frustrated companion that will express their unhappiness through howling episodes and destructive chewing. If you are into doggie sports, you may want to enroll your companion in sledding and carting. These outdoor-related activities will help make your Husky tired and extra happy. At a minimum, take your pet for several brisk walks every day. Loving gentle, playful, happy go lucky dogs that love being part of a family. •	Keen, docile, social, relaxed and casual. •	Not great watch dogs. •	Intelligent, but training them requires patience. •	Huskies make an excellent jogging companion, but not in hot weather..
•	Likes to howl, especially if bored. •	Prone to separation anxiety ~ not a good choice if expected to be left alone for long periods of time. •	Heavy coat has this breed preferring cool climates. Shed their coats twice a year. •	Need a fair amount of exercise they are a very active dog. •	Do not fare well in excessively hot climates. •	Need large fenced yard. •	Not recommended for apartments. •	Prefers to live in packs. •	Prone to hip dysplasia, juvenile cataracts and some skin conditions like dermatitis. •	Can become destructive if bored. •	Good with other pets. •	Not a big eater. The Siberian Husky is a beautiful gracious animal, a dog that sees through you and knows your disposition even before he has met you. They seem arrogant and prince like, not deeming every man worthy of his attention. They appear to be somewhat like a gentle giant, in the meaning he looks kind but still requires respect. Once accepted by a Siberian first then may you experience the loving and awesome disposition of this beautiful creature. The Siberian loves to run and play, being very insightful to the body language of other dogs they almost always becomes a quick friend with most of them. 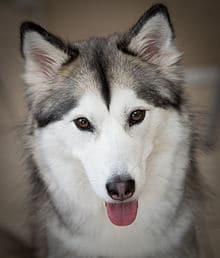 A Siberian seldom argues and will much rather flee then fight, but a dog that offends the huskys honor will see the husky is definitely willing to defend it. The coat of a Siberian Husky ranges in color from Jet Black to Pure White. The colors include black and white, Jet black, silver (dilute) black and reddish black. Wolf Grey- A warm shade of grey with casts of beige, tan, yellow or red behind the ears and saddle area, the undercoat is beige (a wolf like face is not part of this coloration, though they often have it, they may also have open white faces). Sable- This is a beautiful color that reminds of wolf grey though wolf grey has a beige undercoat, sable dogs have red, chocolate or orange undercoats. The temperament of a Siberian Husky is cautious and alert - you have to be worthy of their attention. They are not overly suspicious of strangers or aggressive with other dogs. He is a quick and athletic dog with a moderately compact build and a smooth, effortless gait. This intelligent breed is friendly and gentle and usually bonds more deeply with one person in the family. The Siberian is an independent thinker and can be a bit stubborn at a time. Still, if properly trained then they makes a great companion for the whole family and has a natural affinity for children. Some measure of reserve and dignity may be expected in the mature dog. His intelligence, tractability, and eager disposition make him an agreeable companion and willing worker. The Siberian Husky is not a protective nor possessive dog, it will often share it's treasures and treats with friends. Although he is often affectionate to his entire family, the Siberian is really a one-man dog. With the fact that he is not naturally suspicious towards strangers, this breed does not make a very good watch dog. The free spirit of the Siberian Husky gives him a very real wolf like feel he digs, he hunts and he must run! He is by nature meticulously clean and can often remind of a cats temperament. This allows the dog to run of his energy and satisfies his working needs as well, giving him both physical and mental stimulation. The Siberian Husky breed is highly intellectual and can be trained to do almost anything as seen in movies where these dogs are used. With patience and good training you will have the ultimate life partner. It is a challenge though, They are extremely intelligent, energetic and stubborn. One must expect the unexpected. Since the dog is pack-oriented, it is important to establish yourself as the head of the pack, or alpha very early. It is very important to understand the distinction between establishing yourself as alpha and bullying the dog into submission - It is NOT the same thing! The former is simply a communication that the dog needs and expects, while the latter is very negative and detrimental to the dog's well-being. By establishing yourself as the leader of the pack early, your dog will learn to respect you and look to you for guidance and will know where the boundaries for acceptable behavior lie. Obedience training this breed can be very interesting and extremely challenging. Many owners will complain that their dogs act perfectly in class, but will not obey at home. This breed is intelligent enough to differentiate situations very well, and will apply different rules of behavior for different situations. You must stay on top of the dog and maintain control, which is easier to do while the dog is of manageable size than with a stubborn, energetic adult that has been allowed to get away with undesirable behavior for a long time. The Siberian Husky is recommended to stay on a leash if not in well fenced areas, Thoe there are known cases of well trained Sibes that can be let of the lead at any time, it is still not recommended.